Africa: USAID Announces Winners of $13 Million Clean Tech Award for "Powering Agriculture"
12,000 Households, 350+ Villages: How Crop Waste Is Electrifying Rural India! 2015: Year Zero of Sustainable Development? Could Climate Change Build Big Business in Kenya? Dawn of a New Solar Era? 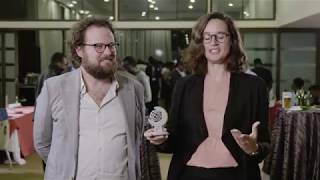 Earthspark Is a UNFCCC 'Momentum for Change' Winner! KickStart International Featured in "A Seed of Maize"
Making It Rain: Solar-powered Irrigation and the "Household Productivity Ladder"
Social Impact: What Are We Here For? Solar powered Agricultural water pumping system is up and running in Senegal! Solar-powered Irrigation Promises Relief to Southern Africa, but Is It Sustainable? Spanish Version of Toolbox on Solar Powered Irrigation System (SPIS) Available! SunCulture's Samir Ibrahim makes Forbes' "30 Under 30" List! The University of Georgia Research Foundation Is a 2019 AE50 Winner! iDE Bangladesh's Riasat Alam Co-authors "Designing a Solar Microgrid System for Powering an Off-grid Fish Hatchery and Nearby Households in Bangladesh"
Powering Agriculture: An Energy Grand Challenge for Development supports the development and deployment of clean energy innovations that increase agriculture productivity and stimulate low carbon economic growth in the agriculture sector of developing countries to help end extreme poverty and extreme hunger. Around the world individuals, organizations and governments are working hard to reduce short-lived climate pollutants through actions, innovations and policies that not only protect our climate but also provide numerous additional benefits. Every year the Climate and Clean Coalition recognizes these efforts, and is proud to announce the finalists for the 2018 Climate and Clean Air Awards. This year there were 85 nominations, an overwhelming response to the awards. From this list 15 finalists were chosen. These ‘fast action heroes’ are involved in a wide range of activities and actions that include everything from individual efforts to state and national policies. The Climate and Clean Air Awards recognize the exceptional contributions and actions taken to implement projects, programmes, policies and practices to reduce short-lived climate pollutants (also known as super pollutants) – black carbon, methane, hydrofluorocarbons and tropospheric ozone. These four pollutants contribute about 40% of the manmade heat energy being added to the planet every year. Reducing emissions of methane, black carbon, and HFCs can help reduce predicted global warming by as much as 0.6 degrees Celsius (⁰C) by 2050, and are necessary to achieve the global goal to limit warming to 1.5 ⁰C. Reducing super pollutants also has additional benefits for health, ecosystems and livelihoods. Implementing reduction measures can prevent up 2.5 million premature deaths from air pollution, avoid up to 52 million tonnes of crop losses every year, and contribute to the sustainable development goals. This year’s award ceremony is part of Super Pollutant Day, an event affiliated with the Global Climate Action Summit, in San Francisco, USA. The ceremony will be held at the San Francisco Museum of Modern Art, from 16:30 to 18:00 on September 11, 2018. The 2018 Climate and Clean Air Awards were presented in three categories: Individual, Innovation, and Policy Change. The Climate and Clean Air Coalition Secretariat created a long list from the 85 nominees. This was sent to the Coalition’s Steering Committee who chose the finalists. An independent jury will decide the final awardees. SimGas (Innovation category): For producing safe cooking fuel and reducing short-lived climate pollutant emissions with domestic biogas digesters. SimGas is helping farmers produce a 100% clean cooking fuel generated by digesting cow manure, helping to reduce methane emissions and reducing indoor air pollution. Read about all the finalists, register for the event, and cast your vote at the 2018 Climate and Clean Air Awards. Congratulations to SimGas! They took home the prize for the Innovative Technology category at the prestigious 2018 Climate & Clean Air Awards. They were recognized for their revolutionary, high-quality and affordable biogas systems, which have tremendous positive impact on climate and health. Congratulations to SimGas! They've been chosen as a finalist for the 2018 Climate and Clean Air Award. This award recognizes exceptional contributions toward reducing short-lived climate pollutants, which contribute about 40% of the manmade heat energy being added to the planet every year. The Biogas Milk Chiller by SimGas enables off-grid dairy farmers to store, deliver, and sell the highest possible quality and quantity of milk. Milk is kept cool overnight until it is delivered/sold the next day. This decreases milk spoilage and increases income potential for dairy farmers. SimGas were big winners at ASME’s 2018 Innovation Showcase! They'll use their $10,000 prize to pilot their biogas milk chiller with a group of 20 Kenyan farmers. They hope to learn more about their payment model, and to further investigate the farmer to processor cooling chain.